All Green Electronics Recycling is a world-class e-waste recycling solution provider that operates not only in the U.S. but also in the entire North America. Let us serve you with our tested IT Asset Disposition Solutions. Recycling old and end-of-life electronics is pretty simple with All Green. We have the highly skilled workers and we have many pickup trucks. Disposing of your end-of-life IT products can be easy with All Green IT Asset Disposition, a tested solution for many years now. Those sensitive files and information must be deleted completely from your hard drives and other digital data portals to protect your brand. A complete destruction of EOL, defective, and recalled IT products is important to your business. One reason is clear – it protects your business name. The list of counties below are where All Green Electronics Recycling North Coast Area Services are able to serve. If your city does not belong in the counties listed above, you can find the nearest drop-off location. If not either way, request a pickup today from your home or business by following the link below. Being a leader in the e-waste recycling industry means we have an extensive network of recycling partners and agents all over the country and even in the entire North America. 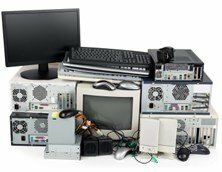 Our expertise is to recycle and reuse all types of obsolete and end-of-life electronics, in order to reduce the contamination that those materials can cause the environment to suffer. For us, this is a smart, economical approach to do. Instead of dumping e-wastes in the landfills, we will provide our ITAD Solutions and IT Asset Remarketing. Don’t procrastinate with your action. Start recycling electronics in an eco-friendly and simple process today. We will collect all your items right from your home or office. Then, we will bring them in our main facilities located in Southern California. In all we do, we always observe the practices behind “Reduce, Reuse, Recycle” Campaign. Computer recycling must be observed strictly. Instead of just leaving your computer units in the basement or in the stock room of your office, try to utilize our beneficial services. Our recycling system will help you benefit a lot by refurbishing your computer units. After the process, you can opt to use them again, or you can resell them on the market with our assistance. Another choice would be to donate those products to charitable groups. You must understand that the hard drives of your disposable computers have sensitive files and information. Digital wiping through our hard drive shredding service is the best way for you to protect your brand from unscrupulous people who may use some sensitive data against you. Allow us to help you protect your name and integrity through implementing a tight data security approach. Contact us right now to learn more information about our Electronics Recycling North Coast Area Services.